We watched a lot of hockey in my house (I know, stop me if you’ve heard that one before) with five playoff games on Saturday and three more on Sunday. Saturday was a beautiful day, so we juggled watching hockey around playing outside and taking part in an elementary school fundraiser. But once the puck dropped at 3 p.m., we were all focused on the games. With all of our teams — Caps (me), Devils (Riley) and Sharks (Ryan) — scheduled to play, this was to be a big day. The Caps started things with a stunning, thrilling 4-3 win over Boston, giving Washington a 3-2 lead in the best-of-seven series. Unfortunately, that was the highlight of the day. In the next game, the Devils lost to Florida to go down 3-2 in their series, but the worst was yet to come. Ryan’s Sharks, facing elimination in Game 5 in St. Louis, held a 1-0 third-period lead after Ryan had gone to bed. But one bad minute turned a 1-0 lead into a 2-1 deficit and eventual elimination. 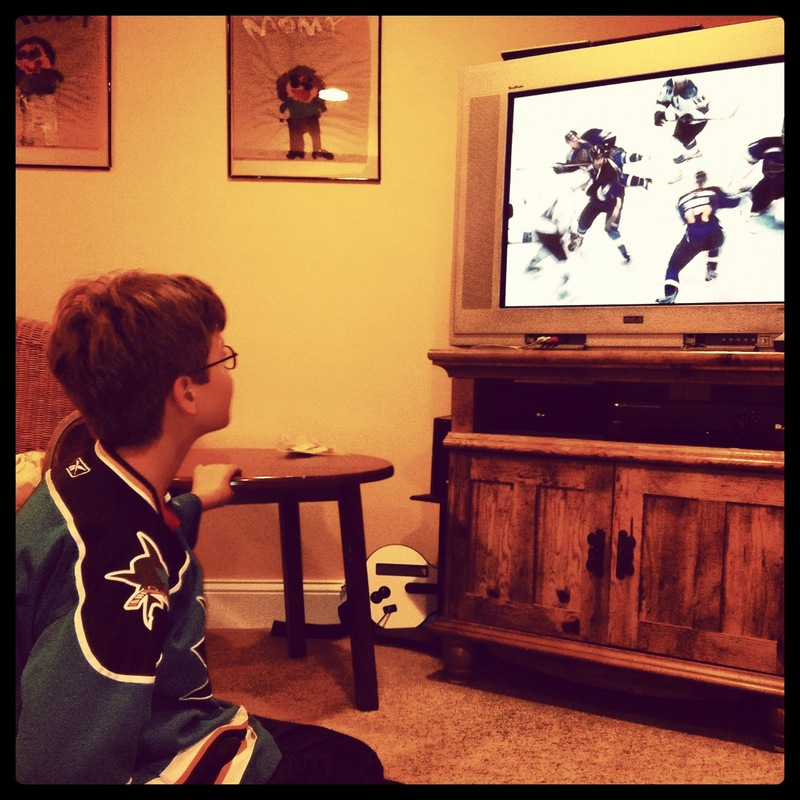 Ryan watches his Sharks attempt to stay alive Saturday night. Veronica and I lamented the end of the Sharks’ season and worried how Ryan would react in the morning. He had said he wouldn’t be too upset because the Sharks only made the playoffs in the season’s final week. Still, we held our breath and listened for a reaction when he woke up Sunday morning and went to check the score. True to his word, he took it well. He was disappointed but not angry and seemed willing to go about his day without incident. Sunday dawned cool and rainy, with the forecast calling for a total washout. Following the Caps’ win on Saturday, Veronica and I joked about taking a spontaneous trip to Washington on Sunday, where the Caps and Bruins would play Game 6 that afternoon. We live only four hours away and have made several trips to see the Caps play in recent years. The idea was never seriously discussed, though I of course spent time on StubHub checking out ticket prices and went so far as to reach out to a friend who works for the team. He does have a science test. It’s open note. He knows the material cold. Besides, we offered, he’d have plenty of time in the car to study. Now he was getting closer to the real issue. Spending the day traveling to and from Washington would have eliminated his opportunity to type NHL standings on his computer. It’s one of his activities that we struggle to regulate. It’s something he loves to do, but the more time he spends doing it, the more difficult it is for him to disengage and interact with the rest of the family. As I said, we were never really serious about the idea, but had Ryan and Riley both wanted to go, it’s quite possible we would have piled in the car and headed south. Spontaneity, at least not in a big-ticket manner like an unplanned day trip, simply is not something that works for our family. Ryan puts up fierce resistance to any unscheduled activity — even if its one he typically enjoys. It’s among the many areas of his behavior that we have to figure out how often to push and how much to allow him to just be him. In this case, it meant no trip to D.C. Just as well since the Bruins won in overtime Sunday, sending the series back to Boston for Game 7. We’ll be watching that one, from home. I’ve already put it on Ryan’s calendar. I totally understand and feel for you. We can’t do spontaneous either, However I have learned to take ownership of the change for example, I would have to say its my fault we need to change whatever we are doing,,you might of said…”Ryan, we have been given the chance to go and we would like to treat you because you studied so hard for your test. I know this works for us, my son also comes up with excuses. The way the weather here in DC was you wouldn’t have wanted to make the drive anyway. Good choice to stay home. Very proud about the manner the the sharks loss was taken. He is growing up and putting his lessons into play, I know how much you all work with him. So pat yourselves on the back. Spontaneity?! What’s that? We can manage it occasionally, but we also have the days where it’s best just to stick with routine…glad he handled the Sharks’ loss so well! It was nice of the B’s to win for us in overtime on Sunday. Given the way the Sox are playing this season, at least Boston got a little joy. We’ll be watching from home on Wednesday too. At least one of our boys will be happy at the end! So I have readers who root for the Bruins, Caps, Flyers, Pens, Hurricanes, Red Wings. … Am I missing anyone?